Hoarding is just a word. Actually I would say that some of the loveliest people I have ever met hoard. Would most people describe your collection as excessive? REGIFTING. Given the financial investment you made in purchasing an item, pick one spot (proportionate to the storage space that your environment permits) and store things for future gifting occasions (only if you will actually re-gift it). NOTE: The storage space designated for re-gifting cannot interfere with any space normally used for activities of daily living. We will talk more about “the activities of daily living” in a future blog. RECYCLING. These items can, and will be removed regularly according to your area’s recycling schedule. Before pickup, they cannot be stored in areas where activities of daily living occur. DISCARDING. These items are taken away regularly on garbage day. Are there some areas of your environment that can’t be used for their intended purpose? 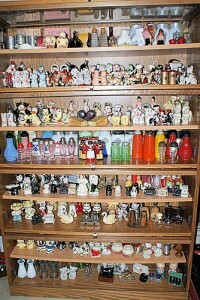 Collections usually have a social aspect to them. We are proud of them. They give us pleasure and we usually want to display them and show them to people who we think will also appreciate them. We are likely to want to share them with others. We take care of them and maintain them. They are part of our “social life”. So are you really a collector, or do you hoard? Check out www.hoarding.ca for more information about hoarding and watch for the new book entitled Clearing the Path: Take Back Your Life When Your Things are Taking Over by Elaine Birchall and Suzanne Cronkwright COMING SOON. Follow us on twitter @Clearingthepath or Facebook at Clearingthepathbook. Elaine Birchall MSW RSW - Elaine is recognized as the leading Canadian expert in the field of Hoarding. With over 20 years’ experience as a community based and clinical social worker, she has provided training and consultation to individuals, families, professionals, and community organizations across North America and internationally. In the last three years alone, Elaine has assisted 212 clients/families and over 130 peers, and offered more than 80 training courses and workshops on hoarding to individuals and professionals in North America. She is sought after as a keynote speaker and her work has received frequent acknowledgement in print, radio (U.S.A. and Canada), and television media, including features on W5, Canada AM, and 16x9 The Bigger Picture. She recently hosted a six-part series with Canadian regional TV, Channel 22 in the Ottawa area. Suzanne Cronkwright - Suzanne is a successful technical writer, editor, and instructional design professional with over 30 years’ experience in both high tech and government in Canada. She is recognized for her ability to translate complex technical subject matter into simple, clear procedures. Working with Elaine on Clearing the Path has provided a wonderful opportunity for Suzanne to fulfill a lifelong dream of using her writing skills to “make a difference” in the lives of those around her. Next QUIZ: Are You a Hoarder in the Making?